Pritsana manages to cook and cater for about thirty people when she’s not busy designing print materials and Web sites for non-profit organizations and for-profit companies. Now, if only her mother would believe that she can actually cook. Parents are always looking out for their children, so whenever Pritsana would visit them with dishes she cooked, they refuse to eat them because they’re thinking that she needs to eat more than they do. Sometimes, parents never realize that their children can get food without their help. 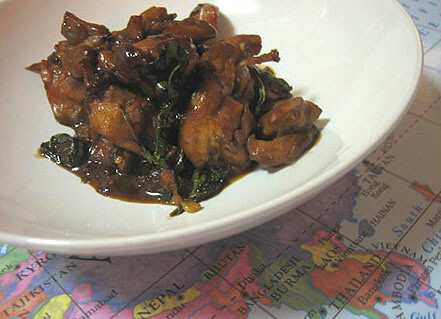 Ka Prow translates to the Thai holy basil, one of the staples of Thai cooking and the main spice to this dish. (You leave off the R when you pronounced the prow.) We used chicken here and Thai locals would refer to it as Ka Prow Gai in which gai is the chicken. You can find kaffir lime leaves at a well-stocked Asian grocery store. They usually have them in the freezer so ask one of the clerks to make sure they’re not hiding the goods from you. There really isn’t a perfect substitute for them, but if you can’t get them dried, try using lime zest. You can also get Thai holy basil at the same store, but you can substitute the tinier, more purple sweet basil. Italian basil will do, too, if you don’t have access to Asian produce. You can also use brown sugar instead of the palm, and less soy sauce if you’re not using the semi-sweet kind. Thais cook this dish with ground pork and I can imagine you can use shrimps as well. Top with fried egg and you’ll be smiling. 1. Heat some oil in a heated large wok. SautÃ© garlic until light brown and cook onions until translucent. Add chicken and enough soy sauce to cover half of them. Cook chicken while stirring occasionally, about 10 minutes. 2. When chicken is almost done, stir in the rest of the ingredients and cook for another 5 over medium-low heat or until basil leaves are wilted. i think i’m craving for some thai now…looks easy to tweak but need to grab some ingredients that i don’t have right now…thanks for the tips!